Chase Freedom Unlimited®: Is It A Top Cashback Card Contender? If paired with the Chase Sapphire Preferred, the Freedom Unlimited has the potential to be the best flat-rate cash back card. The new Chase Freedom Unlimited® has quickly earned its place among top rewards credit cards. The flat 1.5% rewards rate is well above average, and the 3% cash back on purchases (up to $20,000) for new cardmembers increases the card's value as well. Furthermore, the Chase Freedom Unlimited® belongs to the Ultimate Rewards family of cards, which means it can be paired with other cards to increase its value. How Does The Chase Freedom Unlimited® Compare? Review: Is The Chase Freedom Unlimited® Worth It? The Chase Freedom Unlimited® is one of the best cash back credit cards around. It offers a flat 1.5% back on all your purchases, which is on par with some other cards such as the Capital One® Quicksilver® Cash Rewards Credit Card or Barclays CashForward™ World Mastercard®. What puts the Chase Freedom Unlimited® above those options is that it belongs to the Chase Ultimate Rewards family of cards. Instead of earning straight cash back, Chase Freedom Unlimited® cardholders get Ultimate Reward points with every purchase. If you also have the Chase Sapphire Preferred® Card, these points become very valuable, as we explain below. Bottom Line: The new Chase Freedom Unlimited® is a great choice for most consumers. If you pair it with the Chase Sapphire Preferred® Card, it becomes the best all-around cash back credit card to have. The Chase Freedom Unlimited® gives its users 1.5 Ultimate Reward points for every $1 spent. The card belongs to what we call tier one Ultimate Rewards. Tier one cards are ones where the points you earn can only be redeemed towards cash back or gift cards, at a rate of $0.01 per point. You can tell which card is tier one, since it will be one with no annual fee. Tier two Ultimate Rewards cards, such as Chase Sapphire Preferred® Card and Ink Business Preferred℠ Credit Card, allow you to transfer your points to a number of different airline and hotel partners. With the Chase Freedom Unlimited® card, new cardmembers can earn 3% cash back on all purchases in the first year for up to $20,000 spent. After that, you'll earn a flat 1.5% back regardless of where you spend your money. Things such as balance transfers, cash advances, or interest charges do not count. If you already have a Chase Sapphire Preferred® Card you should apply for the Chase Freedom Unlimited®. Both cards earn users Ultimate Reward points and can be pooled together. Normally, you can only use your Chase Freedom Unlimited® rewards on cash back and gift cards. However, if you have a tier two Chase card your points can be transferred to a number of different airline and hotel partners. By having the Chase Sapphire Preferred® Card on your account, the value of Chase Ultimate reward points goes from $0.01 to $0.0125 or more. That means the rewards rate on the Chase Freedom Unlimited® can go up from 1.5% to 1.875% or more. If you manage to get a value of $0.0134 per point when transferring, the Chase Freedom Unlimited® can beat all other flat-rate cash back credit cards – including the Citi® Double Cash Card. If you were approved for five credit cards within the last 24 months, you will be instantly denied for any new applications with the issuer. Even if your accounts have since been closed, they count towards the so-called ‘5/24 rule’. This applies to all credit card accounts, not just ones from Chase. If you have crossed this limit, we recommend waiting before applying for the Chase Freedom Unlimited®. When you apply, a hard inquiry will be processed in your credit history, causing your credit score to go down. Since you are guaranteed not to get approved, doing so will only hurt your financial standing. How Does The Chase Freedom Unlimited® Compare To Other Credit Cards? The measure of any credit card’s value can only be obtained by comparing it to other available options. To test the usefulness of the Chase Freedom Unlimited® we matched it up against some of the best credit cards to see where it falls. The Chase Sapphire Preferred® Card is one of the best travel credit cards, and like the Chase Freedom Unlimited® it earns users Ultimate Reward points. This card comes with a $95 annual fee. In order for it to be worthwhile, you need to spend heavily in dining and travel categories, where this card awards you 2x points per $1. You need to spend at least $3,850 per year in those two categories to break even. Since both these cards earn points in the same reward program, they compliment each other well, as we explained above. If the Chase Sapphire Preferred® Card fits your budget and your credit capacity, the best strategy is to also apply for the Chase Freedom Unlimited®. Once you have both, use the former on dining and travel purchases, and the latter on everything else. The Chase Freedom® is one of our favorite credit cards, and has long been Chase’s flagship cash back card. It earns users 5% cash back up to $1,500 on categories that rotate each quarter. When you manage to spend inside the 5% bonus categories, the Chase Freedom® is hard to beat. All other purchases, however, will only get you 1% back, whereas the Chase Freedom Unlimited® remains at a flat and unlimited 1.5% anywhere you shop. Since both cards have no annual fee, it makes sense to pair them. Use the Chase Freedom® whenever you can get 5% cash back, and the Chase Freedom Unlimited® on all other purchases. 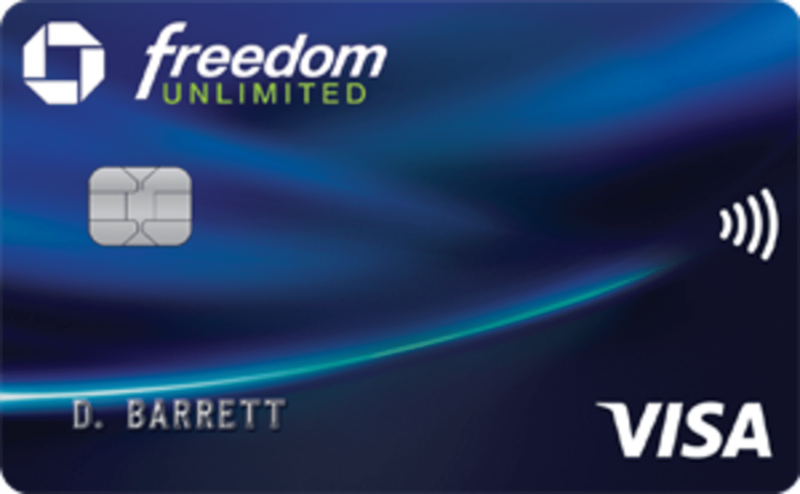 The Chase Freedom® is a tier one Ultimate Rewards card - this means having both will not allow you to transfer your points. Note: You can have both the Chase Freedom Unlimited® and the Chase Freedom® at the same time. If you already have the latter, it's best to apply for the Chase Freedom Unlimited®. Do not to a downgrade, as you may not qualify for the 3% cash back rate on all purcahses in the first year (up to $20,000). The Barclays CashForward™ World Mastercard® is one of the most recent flat 1.5% cash back credit cards. Every time you redeem your rewards for the card, you get a 5% bonus towards your next redemption, pushing the card’s rewards rate closer to 1.6%. If the two cards are looked at in isolation, the Barclays CashForward™ World Mastercard® is slightly better in the long run. However, if the Chase Freedom Unlimited® is paired with the Chase Sapphire Preferred® Card it beats the Barclays offer. The Citi® Double Cash Card has long been heralded as the king of fixed rate cash back credit cards. It provides 1% cash back at the time of purchase, and another 1% when that purchase is paid off. This is significantly better than the Chase Freedom Unlimited® which only produces 1.5% back. However, as we noted above, if you have the Chase Sapphire Preferred® Card as well, the effective rewards rate on the Chase Freedom Unlimited® can be higher than 2%, provided you transfer your points and get a value better than $0.0134 per point. In order to match yourself with the best credit card possible, it’s important to consider how and where you spend most of your money. To do so, you can use our interactive tool below. Enter your estimated monthly budget, and our calculator will display for you the estimated net value of each card over a period of 2 years. Currently there are three ways of applying for the Chase Freedom Unlimited® – either online (by clicking "Apply Now" above), over the phone or in a branch. The phone number to call is 1-800-432-3117. If you prefer to apply in branch, you can visit Chase’s website to locate one nearest you. You will need to have a good to excellent credit score in order to get this card (generally, nothing lower than a FICO of 700).